Tonight is the closing night of yet another triumphant Summertyne Americana festival, the weekend had seen a plethora of the finest acts around grace multiple stages in and around the Sage Gateshead. The closing night is a triple headed line up of exquisite acts all of whom bring something slightly different to the party. Opening up the show is the brilliant Country starlet Sarah Darling, whose set is awash with country ballads. In an industry where pop-country is steadily eroding the old style, Sarah Darling provides a slightly more traditional take on the genre with tracks like the beautiful Halley’s Comet and Where Cowboys Ride. There are glimmers of that more modern Country sound in Shimmer Like Gold, but mostly Sarah Darling’s set is packed with delicate Country ballads that have this packed crowd firmly under her spell. She opens this packed show in exquisite style and closes out her set with a rather emphatic rendition of her new single Diamonds. It’s a very well received set and her new material seems to be following in a similar vein to her previous work so we can’t wait to hear what else she has in store for us with her next record. Next up is a man who has yet to even release a record of his own, Sam Palladio made his name on the TV programme Nashville and following the climax of the show he’s made his way out on tour. Tonight is a set packed with a mixture of his own compositions and some of his favourite tracks from the show, including his first song which was featured as the last song he personally played on the show Going Electric. His personal work is somewhat different to that which he performs in the show, but no less exciting. The likes of Adios Old Friend and Goodbye Blue showcase a much softer and gentler side, these deeply heartfelt songs cut through the fervent guitar riffs that exude from the rest of his set. Going Electric is a definite highlight but equally the stirring tones of Lightning Bones really kicks things up a notch, it’s an undoubtedly impressive set from the TV star. However, it’s one song which captures the hearts of everyone in this hall as they’re all left stunned by the beautiful Wake Me Up In Nashville, one of Palladio’s own songs that is packed with heartfelt sentiments. As if all this wasn’t enough the firecracker duo of Justin and Sarah better known as Striking Matches are still yet to take the stage. This pair are a rabble rousing, guitar duelling duo who never fail to impress. Opening with new song Retrograde, they’re quickly into their stride, a slew of new tracks follows all heavier and more intricate than ever before. As guitarists this pair make your jaw drop with their incredible talents. The brilliant Trouble Is As Trouble Does has the crowd singing and chanting along every word as the pair continue to impress. This is followed by a more downbeat rendition of When The Right One Comes Along, with the pair showing off their more delicate side. 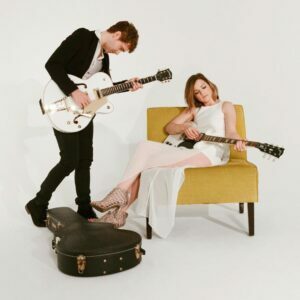 A number of Striking Matches tracks have been featured in the TV programme Nashville and When The Right One Comes Along is one of their most famous and that shows tonight. It’d also be rude for the pair not to be joined on stage by Sam Palladio, who re-takes the stage for an ecstatic rendition of I Ain’t Leavin’ Without Your Love. They close out their set with a cover of Crossroad Blues, that once again has this entire crowd in full voice, but they save the best of their covers until the very end with a brilliant cover of Fleetwood Mac’s Never Going Back. Rounding off this brilliant night and epic weekend of music in true style, Striking Matches are one of the most talented bands around without a doubt and tonight they really shine in amongst a trio of awesome artists. ~Sarah Darling can be found online here sarahdarling.com. She is also on Facebook and tweets as @_SarahDarling. Sam Palladio is on Facebook and tweets as @SamPalladio. Striking Matches can be found online here strikingmatches.com. They are also on Facebook and tweet as @StrikingMatches. Hmmmmm…..I was there and have a different set of memories. I pretty much agree with the Sarah Darling comments; but Sam Palladio was ‘patchy’ to say the least; with the ballads being well received by an adoring crowd; who seemed confused by the Electric/Rock songs. Plus, I certainly don’t remember anyone ‘singing and chanting along’ to anything by Striking Matches; although I do recall about twenty people sneaking out shaking their heads as it was incredibly loud.